In order to tap the market for Windows users, the Finland-based Rovio mobile has extended its popular puzzle video game, Angry Birds to Windows platform, which through Intel AppUp platform. 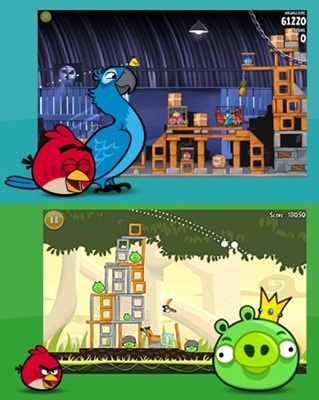 Angry birds is one of the most popular games features challenging physics-based demolition gameplay that require logic, skill and brute force to destroy the enemy (pigs) on the fields. Currently, there are two versions of Angry birds for Windows platform, Angry Birds and Angry Birds Rio are officially available at Angry Birds PC Shop. Users who interested to install this puzzle video game into their PCs can download the demo version from Angry Birds PC Shop. Note that Angry Birds for PC is not free, with each game costs $4.95. What you download is simply a demo version limited number of levels to entire to purchase the activation code to unlock full game (credit greenberg). Alternatively, you can play web-based Angry Birds for free in any web browser, PC or otherwise. After download, you can follow the below steps to install Angry Birds to your PCs. Double click on the AngryBirdsInstaller_1.5.2.exe or AngryBirdsRioInstaller_1.1.1.exe to execute installation. Click “Next” button to start the installation process, then click “Next” button to accept the End User License agreement. After that, select location where you want the game installed. Click “Install” button to continue the installation process. If your computer show you a security prompt, just allow the installation by clicking “Yes”. Click “Finish” button to complete the installation and launch the game to begin the playing game. The Angry Birds for Window works well in Windows XP SP2 or later, Windows Vista and Windows 7. However, you also can unlock the full version with the price of $4.95 for each game. According to the company, the Angry Birds Seasons for Windows will be available soon.